Dragon Age: Inquisition's current build still needs a lot of work, but its developers can play the entire main storyline over the holidays. As consumers, it can be interesting when developers pull back the veil and give us a glimpse at the process of making a video game. 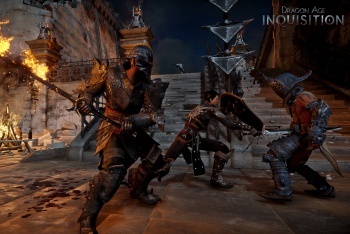 A blog post from BioWare just delivered a status update on Dragon Age: Inquisition, and evidently the game is coming along nicely - the latest internal build can be played all the way from the start to the credits (which, actually, probably haven't been made yet). The "Holiday build" will let the developers make sure that the main story's pacing feels right, and presumably gives them something to play over the coming holidays. Now, just because you can technically play through the whole game doesn't mean that it's anywhere near finished. The Holiday build is focused on the handful of primary quests that make up the storyline, as well as the game's most important mechanics. It's lacking just a few things, though: the game's voice acting is just getting started, music has yet to be incorporated, and a lot of the graphics technology is still being ironed out. It's safe to say that what's seen in this build is a far cry from what the final version of the game will look like. Meanwhile, Mass Effect 4 also just reached playable status - probably by no coincidence. The Holiday build idea is likely in full effect over there as well, so both games have achieved a baseline - now the developers can focus on adding the rest of the features and smoothing out any wrinkles they may have overlooked. Future blog posts promise to go into detail on other aspects of the creation process, so keep an eye out for more.